RVs are tiny spaces. This fact can make it difficult to find places to store things. To add to the problem, there is very little drawer space, making it nearly impossible to find suitable places to keep smaller items and clothing. Fortunately, there are solutions to this problem. Read on to learn how you can maximize the space in your tiny home-on-wheels, making your travel time a less stressful and more enjoyable experience. Safety pins, paper clips, and rubber bands are all things you likely use from time to time. However, it is also likely that you often have trouble finding them when you need them most. By using a simple screw to attach the lids of baby food jars to the underside of a cabinet, you can create the perfect storage spot for these kinds of items. Simply fill the jar and attach it to the hanging lid for easily accessible, out-of-the-way storage that stays in place during moving day. Over-the-door shoe holders are the ideal solution for storing small items such as hair accessories, small toys, and office supplies. These simple storage tools can be found at almost any box store, and they can be installed quickly and easily without the use of tools. Best of all, they hold everything safely inside even while the trailer or motorhome is moving down the highway. Equally as useful—but perhaps a bit more difficult to install—are the small under-table drawers found at many RV supply stores. These little drawers are typically made of plastic, are run on tracks, and are made to hold items such as remote controls, pens, and pads of paper. Because they are under the table, they are easy to reach but don’t get in the way of other activities. Most RV wardrobes are not very well designed. These long, skinny cabinets are usually deep but not nearly wide enough, and can only hold enough clothing for a few days. 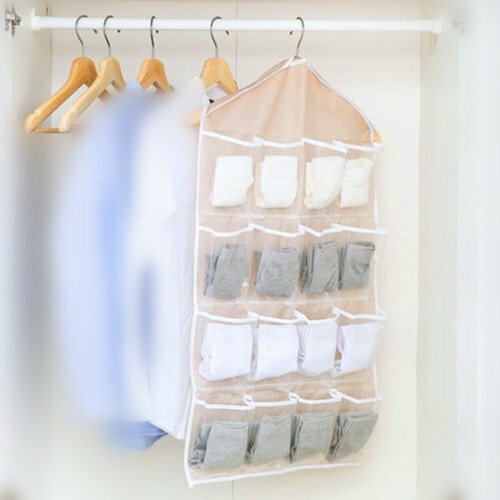 Many long-term travelers find it handy to use a hanging storage solution. These are typically referred to as “hanging sweater shelves”, and because they are tall and skinny, they fit quite nicely into those ridiculously shaped wardrobe cabinets so often found in RVs. Use Scotch Command Strips to attach plastic file holders to the insides of cabinet doors. These nifty little storage boxes can be used to hold papers, boxes of foil and baggies, or anything else that fits. Just be sure to keep it lightweight in case the Command Strips fail during a particularly bumpy ride. Another idea for those looking for ways to store clothing is the pillow storage trick. Simply buy some pillow shams that match your decor and fill them with out-of-season clothing. This is an impossibly easy storage solution that gets those extra clothes out of the way while also adding to the look of the place and giving you a place to rest your head as you dive into a good book. These six simple tricks are sure to help you feel more comfortable and organized in your teeny tiny living space. This is a feeling that definitely makes the little bit of extra effort worth your while. Do you have a tip to add? Please share it in the comments below! From time-to-time, we have guest bloggers post on our site. The views, opinions, and positions expressed within these guest posts are those of the author. This is my wifes idea She gets my vote. Love these! I’ll have to look into getting some. We also have a 28 foot with only one bathroom door. We use the over the door storage on the bathroom door. My wife and I purchased a new motor home in April, it’s 25 feet with 3 slides. Sleeps six but is perfect for the two of us. With all said, we recently took a trip from San Francisco Bay up to Vancouver Canada. Your tips for space saving on long trips is invaluable. Thanks, and I look forward to more great ideas. we learned quickly, that trips to Costco where out of the question. It is not just about space, it is also about weight. We use paper plates or plastic. We don’t keep a lot of food in refrigerator, go to store more often. Pillow storage!!!! What a great idea and a place to put the heavy blankets when not using. We traveled for one month last year and when not using the heavy blankets they were always in the way – I will get pillow shams. Everything else I already do and they are great tips. One not mentioned that we do is put “stick on” spice holders inside the pantry doors. They are plastic and use two sided tape so I just cut them to fit and stuck them up and now my spices are not taking up valuable pantry drawer/shelf space. For my closet I took Plastic Link Chain wrapped it around the rod using zip ties to fasten it. Take a shirt or pair of shorts to link lowest you want to go. Cut chain then create another hanging strip. Hang items every other loop. You can pull bottom loop out toward room to see what is on strip and to remove easier. Now I can hang shirts & shorts vertically on the chain. Saves space and can organize clothes by color or sets.